Imagine spending four years of your life (at least) specifically training for the Olympic games. Week after week you go through grueling physical workouts while prepare yourself for the huge mental task of remaining laser focused for when the big day comes. When the Olympics do arrive and you are set to compete, all those years of dedication are about to pay off as you push yourself to perform as best as possible. But what happens when you have to step back during the Games, right while you are competing? All those years, and now something happens which forces you to not finish your goal. This is exactly what happened with one equestrian in Rio during the Grand Prix competition. Adelinde Cornelissen won an Olympic silver and bronze, plus World and European gold medals in the past. 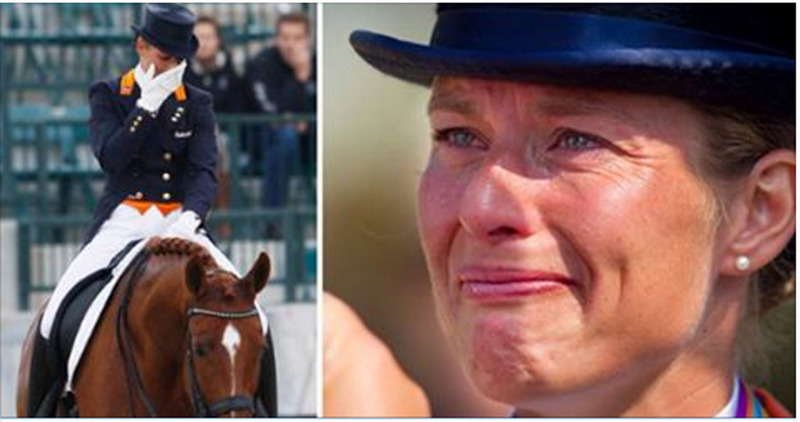 Her amazing horse, Parzival, was her partner all along during this incredible run. It would be mid-test where Adelinde made the decision to pull out and not finish the Games. In the middle of the arena, thousands of people looked on as the event unfolded. Here’s why Adelinde and Parzival’s friendship trumped everything else. The first days in Rio went according to plan: a relaxed flight, stabling good, training good. Parzival feels happy and fit. Until yesterday morning… I planned to train early on Tuesday morning, so I was at the stable at 6am. Saying good morning to Parzival, I saw the right side of his head was swollen, he had been kicking the walls. I took his temperature: he had a fever of over 40 degrees Celcius, but he still didn’t look sick. “Jan Greve came right away and after double checking with the vets here they concluded he was bitten by an insect or spider or some sort of animal, which produces toxics. To get the toxics out of his system we gave him fluids. From 6.30 to 15.45hrs we kept him on this. It helps the kidneys to clean up the toxics out of the body. The vets at the clinic took swaps from the nose and checked the blood. The temperature dropped gradually and by 15.30 it was 38.4… We then took x-rays from the jaw and echoed the area. Just making sure. All ok.
“Then difficult decisions came… We requested the FEI if we could swap starting places within the team, so Parzi could get a day to recover. Competing on Thursdayinstead of Wednesday. But the FEI declined. At that point I didn’t want to compete anymore… Parzival’s health is more important than anything else in this world! “New difficult decisions to make. I had decided yesterday I was not going to compete, but now the temperature was back to normal, he looked fit, was eating and drinking good, I also didn’t want to let the team down… In the back of my mind knowing we had no reserve combination here… What to do? Again difficult descisions… What to do? He is fit now, but you know what happened yesterday… Nobody to fill in my place if I would withdraw, letting the team down. Questions questions… What is wise? I discussed with several vets and the team coach.. The FEI vets came and checked up on him around 10am. I agreed to give it a try. Knowing the story, I took it easy in the warmup and didn’t want to ride full. He was ok, although he didn’t feel very powerful. Normal of course after a day like yesterday. Pretty amazing as Adelinde put her horse’s well being first and foremost as being the most important thing. Please SHARE her wonderful story with all of your friends and family.